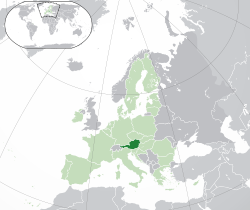 1 Slovene, Croatian, Hungarian are officially recognised regional languages and Austrian Sign Language is a protected minority language throughout the country. 2 Euro since 1 Jan 1999 virtual, since 1 Jan 2002 real currency; before: Austrian Schilling. ↑ http://medienservicestelle.at/migration_bewegt/wp-content/uploads/2012/07/IBIB_2012_Integrationsbericht.pdf STATISTIK AUSTRIA, Kommission für Migrations- und Integrationsforschung der Österreichischen Akademie der Wissenschaften], Wien 2012,p23. ↑ "Human Development Report 2011" (PDF). United Nations. 2011. Retrieved 8 November 2011.